LAST weekend we wrote about Zeroclick, LLC v Apple, Inc. We took note of the relation to a very malicious patent troll, Erich Spangenberg. Days later Watchtrolll wrote about this case as well, adding virtually no new information. I’ve done a few interviews about the latest Apple v. Samsung design patent jury verdict, but journalistic space means I only get a couple sentences in. So, I thought I would lay out a couple points I see as important. We’ll see if they hold up as predictions. There’s been a lot written about the case, so I won’t rehash the epic story. Here’s the short version. The design patent law affords the winning plaintiff all of the profits on the infringing article of manufacture. The Supreme Court ruled (reversing about 100 years of opposite practice) that the article of manufacture could be less than the entire accused device for sale. Because the original jury instructions did not consider this, the Court remanded for a determination of what the infringing article of manufacture was in this case (the design patents covered the shape of the phone and the default screen). The Federal Circuit remanded, and the District Court decided that, yes, in fact, the original jury instructions were defective and ordered a retrial of damages. The District Court adopted the Solicitor General’s suggested test to determine what the article of manufacture was, determined that under that test it was a disputed fact question, and sent it to the jury. Apple asked for $1 billion. Samsung asked for $28 million. The jury awarded $533 million, which is more than $100 million more than the damages were before the Supreme Court ruled. Josh Landau (CCIA) too wrote about these design patents, probably for the dozenth time or so. “Comments from Samsung Jurors Drive Home The Flaws In Design Patents,” Landau argued. We’re very disappointed to see Apple stooping to ‘Microsoft levels’ and 7-8 years ago we called for an Apple boycott (this made it into sites like Slashdot at the time). Has much changed since? Other than Steve Jobs’ death? Well, sometimes we openly support Apple’s patent battles, e.g. against Qualcomm. As we explained before, if Apple wins this dispute, it will be good for phones that have Linux in them as well. In 10 minutes: #Qualcomm v. #Apple #patent infringement trial in Mannheim, Germany. 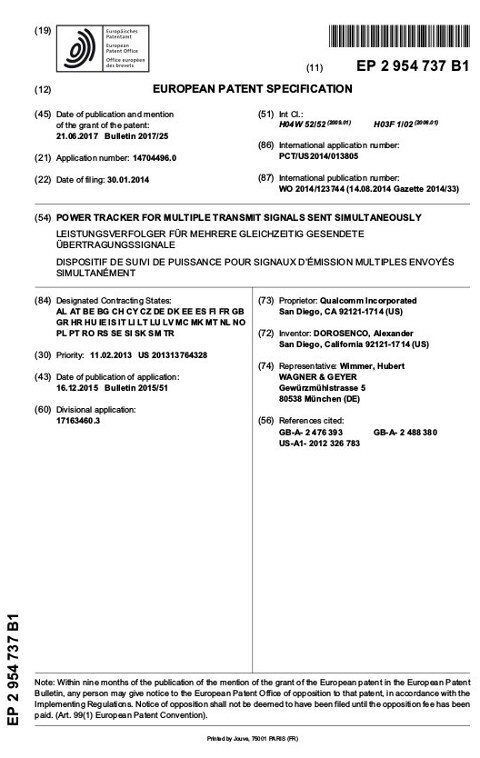 Patent-in-suit: EP2954737 on a „power tracker for multiple transmit signals sent simultaneously“. Well, software patents like these have plagued the EPO, not just the USPTO. We doubt any of that will change under António Campinos; it’s like the EPO goes in the very opposite direction of the US (where the Federal Circuit and Patent Trial and Appeal Board invalidate software patents en masse). Four months back, Qualcomm’s lead counsel in the German Qualcomm v. Apple cases, Quinn Emanuel’s Dr. Marcus Grosch, hoped to obtain a Germany-wide patent injunction against Apple this summer. The related case (one of various patent infringement claims Qualcomm has brought against Apple in Germany) went to trial this afternoon, and it’s unlikely that anything, if ever, will happen in that particular matter before the summer of 2019. The patent-in-suit, EP2954737 on a “power tracker for multiple transmit signals sent simultaneously,” is under massive pressure because of Apple and Intel’s opposition to its recent grant. Of the four prior art references cited, Alcatel Lucent’s European patent application EP2442440A1 poses the greatest–though not the only–threat to Qualcomm’s patent. Yesterday the United States Patent and Trademark Office had bad news for a particularly broad member of Twitter’s key patent family, U.S. Patent No. 9,088,532 on a “device[-]independent message disribution platform.” As I reported in March, the ’532 patent is being reexamined based on a patent application by independent Indian inventor Yogesh Rathod as well as a couple of other prior art references. The reexamination requested related to claims 1-3, 8, 9, 13-15, 17, 20, and 21, all of which are being reexamined. In a (first) Office communication since opening the reexamination proceedings, the USPTO has held all of the reexamined claims invalid, challenging Twitter to persuade the examiner that its patent claims should be upheld.